Many many updates, not all easily noticeable. We hope that solve the problem texture too. we hope that this solve trhe problems whith errors to some people too, but can't test it as we don't have any error. The Vasco Sameiro circuit was built in 1993, it has been renovated in 2008 to be re-homologated by FIA as grade 4 and possibly grade 3. Located in Braga, northern Portugal, it’s managed by a local club with great prestige in the organization of motor events in Portugal, CAM (“Clube Automóvel do Minho”). 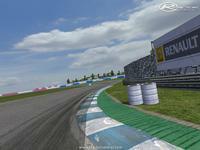 As marshals at this track, we decided to try and make its virtual version. Being our first track, we hope you enjoy it and that it helps promoting and enriching the knowledge of Portuguese circuits. The buildings and objects were made from scratch with Google Sketchup and 3D Studio Max, while others are used from BTB and his Xpaks or ISI tracks (thanks both). Conversion, modification or re-use of any of this package's contents is strictly prohibited without the creator’s proper authorization. I find a bug in image "CAM40.DDS" can cause crash! The fix , copy to SCN folder ! se poderem facam o circuito de drift de lousada !!!! Wow...what a great track...superb design and atmosphere...full 5 stars!!! Wow...what a gem!! Fantastic attention to detail! Superb work gents...thanks very much for sharing!! Millions of thanks for your work. Parabéns!